Texas Star Roofing is versed in all types of ventilation and understands the importance of a properly installed system. Roof ventilation, or more accurately, attic ventilation, is an important component of your roof that oftentimes is overlooked. Ventilation can be addressed cost-effectively whether the roof is being replaced or not. Shingle, paint and insulation warranties are based on FHA Minimum Property Standards, and the Universal Building Code among others. They call for a minimum of one square foot of ventilation for every 300 square feet of attic space. One half of the vent area should be intake, and the other half should be exhaust. For example, a 3,000-square-foot home would require 10 square feet of ventilation, five square feet of intake, and five square feet of exhaust. Shingles — Shingles deteriorate twice as fast when installed over improperly (voids manufacturer warranty) ventilated attics. Heat causes them to dry out, become brittle, and blister, causing a loss of granules. Attics — Ventilation reduces the attic temperature, relieving pressure from the air conditioner and duct work. A cooler attic also reduces the amount of heat transfer into the house. Moisture — Proper ventilation helps prevent moisture from condensing in cold weather, which can damage insulation, rafters and roof deck. Trapped moisture rots wood, robs insulation of its R-value, and even contributes to the growth of mold in the attic. The intake side of the ventilation equation is addressed by installing vents in the soffit on the underneath side of eaves. This facilitates the intake of cooler outside air into the attic, forcing hotter air contained in the attic up and out exhaust vents. Even though it may be 100 degrees or more outside, that’s still much cooler than the 150 to 160 degrees attic temperatures can rise to. Texas Star Roofing is experienced in installing a variety of exhaust systems available. Our professionals can determine which type is the best fit for your roof configuration. Turbines are the most forgiving if the intake and exhaust is not perfectly balanced. It is still very important to have adequate intake, but the turbines are less likely to create the negative pressure some other forms of exhaust can create under the right circumstances, thus pulling moisture (rain water) into the attic. Remember though, you must have intake in order to have exhaust! The turbines require no power to operate, thus no expense. The quality of the bearings has been improved over the years, to the point that the brand we recommend has a lifetime manufacturer’s warranty. Many of you probably have memories of noisy turbines, or ones that stop turning altogether. This is no longer a concern. The only thing negative to be said about the turbines is that some people don’t like the appearance. They look like a large mushroom on your roof and some people prefer a less obvious form of ventilation. The pro to this form of ventilation is that it expels the most hot air of all of the exhaust options. This is due to the fact that it employs the use of an electric exhaust fan. These units are a good choice for hip roofs that come to a point at the top (not much horizontal ridge line). The draw backs are as follows. First off, they are more expensive to begin with, and they require an electrician to wire them in electrically. They use electricity, thus cost money to operate. We’re told, about the same amount as a 100 watt light bulb, about $5.00 a month for each. If the intake is not adequate, it can cause the fans to work harder to expel the exhaust and thus shorten the lifespan of the motor. Solar powered power vents are available. The cost is significantly more than the electrical version; however the need for an electrician is eliminated. Also, the motors are less powerful, expelling fewer cubic feet per minute of exhaust, but still more than the wind driven turbines. These are a passive form of ventilation (not mechanical, hot air rises and escapes through the hole in the roof) utilized by many homebuilders during new construction. They are the least efficient form of ventilation and usually, if they are the choice of ventilation, too few have been installed in order to adequately do the job. The pros attached to this form of ventilation are that they are the least expensive, and in some cases, such as shed roofs or small compartments that are not attached to the rest of the house, all that’s needed is a small passive vent. Ridge vent is being talked about more and more these days on the home improvement shows, and Texas Star Roofing installs a lot of it. The main problem with ridge vent comes into play on steep hip roofs with not much horizontal ridge. Remember, you have to have balanced ventilation and if there is not enough linear footage of horizontal ridge line, you can’t get enough exhaust in place to do the job. Another drawback to ridge vent is the negative pressure we touched on briefly before. If you have more exhaust than intake, it can create a situation where rain is pulled into the attic through the ridge vent. If you’re ever going to have unbalanced ventilation when using ridge vent, it would be best to have more intake than exhaust. The advantages of ridge vent are that the exhaust is spread more uniformly across the roof. Instead of the intake having to travel a greater distance to a turbine, low pro, or power vent centrally located on the roof, the ridge vent is positioned over more area of the roof and thus closer to the intake vents. There is nothing mechanical about ridge vent, therefore nothing to break or wear out, and it costs nothing to operate. One thing to remember, no matter what form of ventilation you decide on, never mix different types on the same roof. 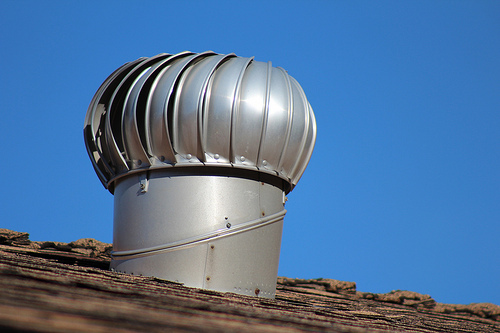 For example, if you install ridge vents, turbines, low pros, or power vents too close to one another, the dominant vent will draw air in through the other exhaust vent instead of the soffit vents located on the eaves of the house. There have been cases reported where electric power vents have actually come on during a rain storm and sucked water into the house through other types of exhaust vents located too close to it. We understand the different types of exhaust ventilation and what will work best on your house. We also know that the key to an efficient ventilation system is a balanced system with not only adequate exhaust, but adequate intake as well. Give us a call for a more thorough explanation of what would work best in your circumstance.